This trim house with its generous front veranda would look equally at home overlooking the Pacific Ocean in Santa Cruz, California, or the Atlantic in Camden, Maine. On a summer evening, all six-over-six panes on the double-hung windows are raised to air out the house while the family gathers to enjoy sunset on the porch. At night, the open upstairs windows lull householders to sleep with the rhythmic shushing of waves on sand. There's probably a telescope permanently set up inside one of those upstairs windows. Note the windowless entry door surrounded by half-height muntinned windows, with a matching transom over the door. That's a great combination for both privacy and light. 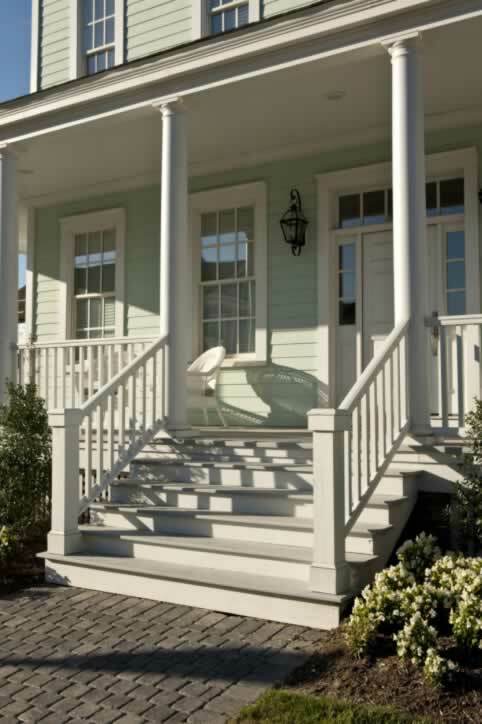 The seafoam green siding color is a natural choice for the area, just as those wicker chairs on the porch make visiting friends, family, and neighbors the most natural pastime imaginable.